The Chuboomba is an enemy found in Mario & Luigi: Bowser's Inside Story and Mario & Luigi: Bowser's Inside Story + Bowser Jr.'s Journey. Their name is a portmanteau of "chubby" and "Goomba". Chuboombas are large Goombas holding lollipops, and are encountered at Cavi Cape and Plack Beach. Chuboombas are fought by Bowser in the overworld, and are the first (and weakest) normal enemy he encounters. 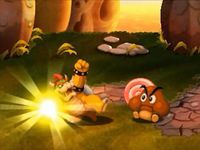 In battle, it attacks by tackling Bowser, which he must counter with a punch. If it wheezes before tackling, it will hesitate before impact, so the player must remain alert. Mario and Luigi can also go to Cavi Cape and/or Plack Beach to fight Chuboombas and their attacks can be countered by jumping. If Bowser uses the Vacuum Block to inhale a Chuboomba's lollipop, he will recover 20 HP, and the Chuboomba will burst into tears and flee. Chuboombas are usually fought by themselves or with other Chuboombas accompanying them in Cavi Cape. In Plack Beach, they only appear in battle with Toothies; they never appear on the overworld. Also, Bowser can use the Vacuum Block to inhale a Blitty from Chuboombas, and despite being very unintelligent, they can dodge Bowser's punches by simply moving in a different direction. Chuboombas are always the target for the demo of Bowser's Brawl Attack. Unless the player gets an "Excellent!" during the attack, the Chuboomba will not be defeated and instead run away. In Mario & Luigi: Bowser's Inside Story + Bowser Jr.'s Journey, they are depicted as being more brown in color and their lollipops are entirely pink rather than white with a pink swirl. They also appear as enemies in the Bowser Jr.'s Journey mode, where they are melee troopers. Like other variants of Goombas, Chuboombas are weak against yellow Shy Guys. Notice: The second set of numbers next to the enemy's HP, POW, DEF, SPEED and Coins are stat increases from the Challenge Medal accessory; a 50% increase for HP, DEF, SPEED and Coins earned, and a 150% increase for POW. Bowser Jr.'s Journey bio: Rotund Minions resembling Goombas. They're extra tough... maybe because of all that hard candy they eat. Kurishinbō "Gluttoomba", portmanteau of kuishinbō, "glutton" and kuribō, Goomba's Japanese name. Note that both bōs have same meaning. Spanish (NOA) Ñamoomba Pun of Ñam (onomatopoeia for yum) and Goomba. Spanish (NOE) Goombaleta Pun on Goomba and piruleta (lollipop). French (NOA) Miamoomba Pun on Miam (yum) and Goomba. French (NOE) Goulumba From goulu (glutton) and Goomba. German Mampf-Gumba From mampfen (munch) and the German word for Goomba. The top screen of Bowser's Brawl Attack demos/tutorials always show a Chuboomba being defeated by the acquired Brawl Attack without the lollipop, which is normally impossible, since a Chuboomba without a lollipop usually flees from the battle. This was fixed in the remake, as it now shows the lollipop with the Chuboomba. This page was last edited on April 16, 2019, at 16:50.